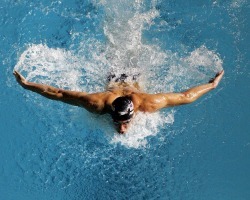 I have been involved with swimming for over 30 years as both a swimmer and coach. It has been my experience over the years that the repetitive injures common to swimming respond very favourably to traditional chiropractic care and I only wish I had known of the benefits of chiropractic care 30 years ago. Barnathan has worked with athletes worldwide, including super swimmer Dara Torres, who used chiropractic for her back, hips and shoulders before resuming training for the Olympics in 2000. In the pool, she found that chiropractic provided great relief for her body-post-workouts and prior to competition. According to Torres, “when you need a quick fix and don’t have time to rehab something, I always found quick relief from chiropractors,”. Olympic head coach Richard Quick began using chiropractic resources at the University of Texas in the 1980s. “Chiropractic is playing a larger and larger role in all forms of athletics. It’s an issue of figuring out what works and helps athletic performance, and making it a part of your program,” he says. It is often overuse syndromes that plague swimmers and this often difficult to mange the injuries and maintain a high level of conditioning. This is why the chiropractic model works so well for swimmers and other athletes, while rest may be initially needed I have found that it is best to incorporate parts of the activity that is being preformed in the treatment itself. This philosophy lends itself to continued although often modified training and results in minimal loss of conditioning allowing the athlete to perform at peke levels sooner and shortening healing time. For swimmers it is often strained back muscles or shoulder injuries and it is important to strengthen and support these injuries through intensive training. But it is even more important to avoid injuries that can be accomplished through a good warm-up and stretching routine. Please see our page on shoulder stretching.